A collection of Virginia Wesleyan College newspapers from 1966-2008. The first newspaper, known as The Newspaper, was issued on December 9, 1966. The subsequent issue on February 24, 1967 was entitled, Village Voice, a name it held until December 17, 1971, when it became Transcript. 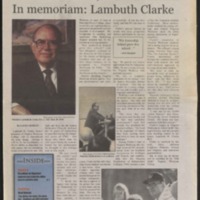 Transcript became Crosswinds on September 9, 1974 until October 18, 1982 when it became the Marlin Chronicle. 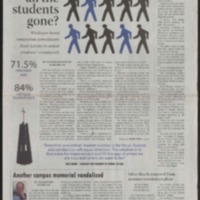 The newspaper continues to be known as the Marlin Chronicle and VWU Digital Collections has issues up to, and including, May 2, 2008. 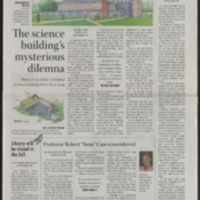 The May 2, 2008, vol. 29, no. 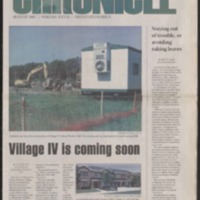 10 issue of the Marlin Chronicle, the student newspaper of Virginia Wesleyan College. 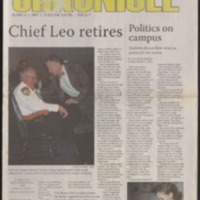 The April 18, 2008, vol. 29, no. 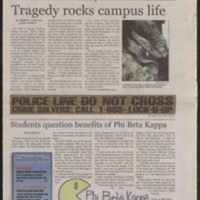 9 issue of the Marlin Chronicle, the student newspaper of Virginia Wesleyan College. 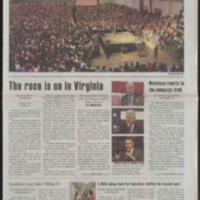 The March 28, 2008, vol. 29, no. 8 issue of the Marlin Chronicle, the student newspaper of Virginia Wesleyan College. 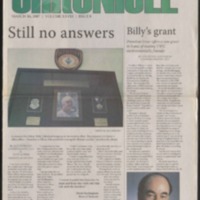 The February 29, 2008, vol. 29, no. 7 issue of the Marlin Chronicle, the student newspaper of Virginia Wesleyan College. The February 15, 2008, vol. 29, no. 6 issue of the Marlin Chronicle, the student newspaper of Virginia Wesleyan College. The November 30, 2007, vol. 29, no. 5 issue of the Marlin Chronicle, the student newspaper of Virginia Wesleyan College. The October 19, 2007, vol. 29, no. 3 issue of the Marlin Chronicle, the student newspaper of Virginia Wesleyan College. The September 28, 2007, vol. 30, no. 2 issue of the Marlin Chronicle, the student newspaper of Virginia Wesleyan College. The September 14, 2007, vol. 29, no. 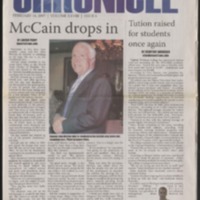 1 issue of the Marlin Chronicle, the student newspaper of Virginia Wesleyan College. 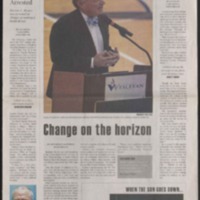 The August 1, 2007, Orientation issue of the Marlin Chronicle, the student newspaper of Virginia Wesleyan College. 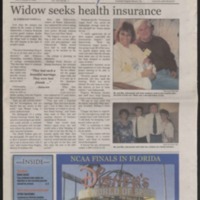 The April 27, 2007, vol. 28, no. 10 issue of the Marlin Chronicle, the student newspaper of Virginia Wesleyan College. 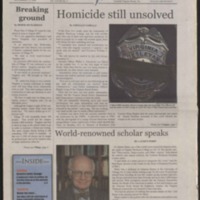 The April 6, 2007, vol. 28, no. 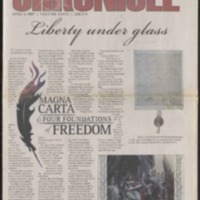 9 issue of the Marlin Chronicle, the student newspaper of Virginia Wesleyan College. The March 16, 2007, vol. 28, no. 8 issue of the Marlin Chronicle, the student newspaper of Virginia Wesleyan College. The March 2, 2007, vol. 28, no. 7 issue of the Marlin Chronicle, the student newspaper of Virginia Wesleyan College. The February 16, 2007, vol. 28, no. 6 issue of the Marlin Chronicle, the student newspaper of Virginia Wesleyan College. 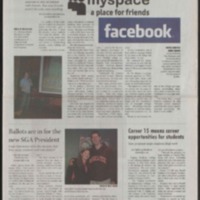 The December 8, 2006, vol. 28, no. 5 issue of the Marlin Chronicle, the student newspaper of Virginia Wesleyan College. 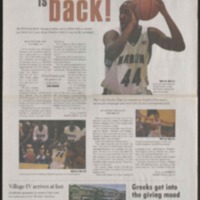 The November 17, 2006, vol. 28, no. 4 issue of the Marlin Chronicle, the student newspaper of Virginia Wesleyan College. The October 27, 2006, vol. 28, no. 3 issue of the Marlin Chronicle, the student newspaper of Virginia Wesleyan College. The October 6, 2006, vol. 28, no. 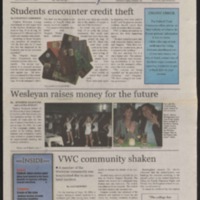 2 issue of the Marlin Chronicle, the student newspaper of Virginia Wesleyan College. 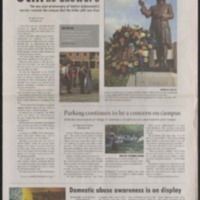 The September 22, 2006, vol. 28, no. 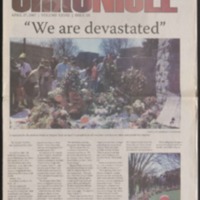 1 issue of the Marlin Chronicle, the student newspaper of Virginia Wesleyan College.